This guide covers advanced EHS features such as Kiosk Mode and Secure Mode. It assumes a working knowledge of Enterprise Home Screen and use of its Advanced Settings through direct manipulation of the enterprisehomescreen.xml config file. For those not familiar with these procedures, please refer to the About and Setup pages and the Advanced Settings Guide before continuing. Note: Many of the capabilities of EHS can be accomplished manually on the device, programmatically through EMDK or remotely using StageNow or a third-party mobile device management (MDM) system (if supported by that MDM system). EHS simply puts the capabilities into a single tool. Kiosk Mode is designed for devices to run a single application, often with a touch-based UI. Examples include retail price checkers, auto parts look-ups, patient check-in systems and so on. Kiosk Mode also can be useful when dedicating a device to a single user and/or task, such as a retail clerk's hand-held barcode scanner. Kiosk Mode places the app in full-screen mode and prevents the BACK and HOME keys from being used to exit the app. This is the main difference between Kiosk Mode and the EHS Auto-Launch feature. On Android L devices: Kiosk Mode should not be used with Screen Pinning, a feature in Android L that works in much the same way. Specify the Kiosk app in the <kiosk> section of the config file. Enter a value of '1' in the <kiosk_mode_enabled> tag in the Preferences section of the file. If USB Debugging is desired in Kiosk Mode, enter a value of '0' in the <usb_debugging_disabled> tag. (See Disable Kiosk Mode below for details). Security Note: When using Kiosk Mode, be sure to disable 'key remapping' and other possible methods of launching applications, which would thereby defeat Kiosk Mode safeguards. If USB Debugging was not disabled for User Mode, disable Kiosk Mode by pushing to the device a config file with a value of '0' in the <kiosk_mode_enabled> tag. If USB Debugging was disabled for User Mode, perform a factory reset. Security Note: When using Kiosk Mode, be sure to disable "key remapping" and other possible methods of launching applications, which would thereby defeat Kiosk Mode safeguards. In Secure Mode, EHS will accept only a signed EHS configuration file, thereby preventing unauthorized changes to the file. To operate in Secure mode, EHS requires a signed config file (enterprisehomescreen.xml) and a matching signature file (enterprisehomescreen.pem). A device that is not in Secure Mode is considered to be running in Normal Mode. When in Normal Mode (the default), EHS will accept an unsigned config file and act on any configuration settings within it, as long as the name of the file and its contents meet EHS specifications. These instructions require Android Debug Bridge (ADB) for communication with the device and OpenSSL for the creation of device certificate and private key files. If necessary, please install ADB and OpenSSL for Windows before proceeding. 3. Copy the caroot.pem to the SD card on the device. This will cause the root certificate to be installed on the device. 6. Create the EHS configuration file (enterprisehomescreen.xml) as described in the Advanced Settings section. If successful, the process of signing the enterprisehomescreen.xml file will produce a signature file called enterprisehomescreen.pem. Important: Be sure to use the same version of OpenSSL to sign the config file as was used to generate the root certificate. 8. Push the signed config and signature files to the /enterprise/usr folder. 9. Install and run the EHS APK as described in the Setup Guide. At launch, EHS will attempt to match the config and signatures files with the device certificate. If successful, EHS will run in Secure mode and implement the settings in the signed config file. If matching is unsuccessful, the device will go into a Lockdown State (see below). Note: When running in Secure Mode, the configuration and signature files are no longer stored in the /enterprise/usr folder. To retrieve the config file when the device is in Secure Mode, use the Export Configuration File option available under Tools menu in Admin Mode. The first step in returning a device to Normal Mode is to disable Secure Mode. This requires removal of EHS from the device and must be done by an administrator. Perform an Enterprise Reset (refer to the device manual for details). With Secure-Mode EHS removed, follow the EHS Setup Guide for normal installation. A device running in Secure Mode will enter Lockdown State if the signed config file (enterprisehomescreen.xml) and its matching signature file (enterprisehomescreen.pem) cannot be verified against the corresponding certificate installed on the device. When this state is reached, the device will display a screen similar to the image below along with the reason for the lockdown. Copy the valid EHS config and signature files to the /enterprise/usr directory on the device. This will cause EHS to exit the Lockdown State, import the config file and return to Secure Mode. The valid files can be copied manually via ADB or deployed using an MDM. Log into Admin Mode and delete the signature file from the /enterprise/usr directory. This will cause EHS to exit the Lockdown State and enter Secure Mode. This method will work only if EHS was already running in Secure Mode. If EHS was previously running in Normal Mode and entered Lockdown State due to an unsuccessful attempt to switch to Secure Mode, EHS will remain in Lockdown State. Note: Whether running in Normal or Secure Mode, reaching the maximum number of 10 unsuccessful admin login attempts (or the number otherwise specified in the EHS config file) will disable Admin Mode login. To exit this state, copy a valid config file (and its matching signature file if previously running in Secure Mode) to the device or delete the existing signature file remotely via MDM. 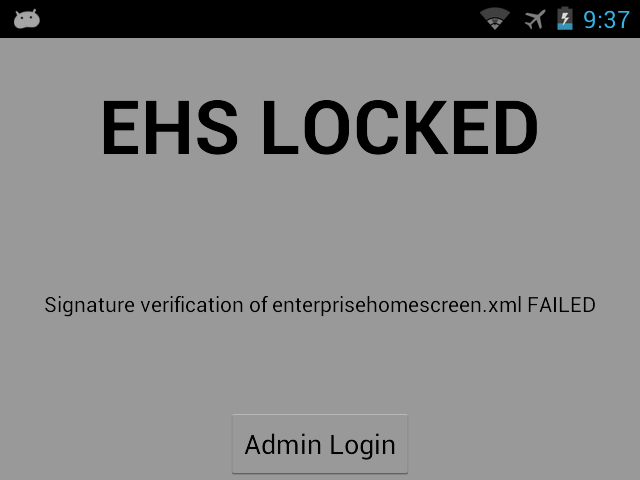 EHS records all major activities, failures and security events in the /enterprise/usr/enterprisehomescreen.log file. These include failed attempts to enter Admin Mode, switches of the operating mode and all EHS errors. The log is a plain text file and can be retrieved with ADB or an MDM and viewed with any text editor. New configuration takes effect; device remains in Normal Mode. Delete the pem file in /enterprise/usr folder remotely or through local admin login. Device resumes in Normal Mode with existing configuration. Once the XML file is detected, the new configuration takes effect in Normal Mode. Signature verification SUCCESS: Device enters Secure Mode. Signature verification FAILURE: Lockdown Mode screen appears immediately with error. As soon as pem file is copied the device will enter Lockdown State. Once the relevant XML file is copied, lockdown screen will vanish and device will enter Secure Mode with new configuration taking effect. WARNING: The recommended order is to copy the XML file first and the pem file second. New configuration does NOT take effect, since the relevant pem file has not been copied. Hence the device remains in the previous configuration, in Secure Mode. Signature verification SUCCESS: Device remains in Secure Mode. New configuration takes effect. Signature verification FAILURE: New configuration does NOT take effect and device enters Lockdown State." Delete the XML file and pem file in /enterprise/usr folder remotely or through local admin login. Device will resume in Secure Mode with previous configuration. Option 1: Copy the XML file (corresponding to the pem file) via Admin login to the device or remotely. Lock down screen will vanish immediately and the new configuration will take effect. Option 2: Delete the pem file in /enterprise/usr folder: lock down screen will vanish immediately and the device will remain in previous configuration." Admin logs into the device and copies a new XML file and the corresponding pem file via file browser in the device. Signature verification SUCCESS: Device enters into Secure Mode and new configuration takes effect. Signature verification FAILURE: Lockdown Screen appears. New configuration does not take effect. Copy a new XML file and the corresponding pem file remotely. Signature verification SUCCESS: Lockdown screen vanishes, device enters Secure Mode, new configuration takes effect. Signature verification FAILURE: Lock down screen remains, new configuration does not take effect. Delete the pem file in /enterprise/usr folder remotely or through local admin login. If the device was in Secure Mode previously: Lockdown screen vanishes and the device resumes in Secure Mode with previous configuration. If the device was in Normal Mode previously: Lockdown screen vanishes and the device resumes in Normal Mode with previous configuration. Do not change any files in the /enterprise/usr folder. Uninstall and re-install EHS. When EHS is launched, lockdown screen appears. Delete the XML file and pem file in /enterprise/usr folder. Then uninstall and re-install EHS. This section covers important interactions between EHS and Android features that might impact device security or application behavior. Accessing an app from the Recent Apps list could represent a security risk; apps not cleared from the list can be activated with the Back button, potentially exposing a non-EHS home screen. EHS does not add apps or activities to the Android Recent Apps list, but apps/activities launched from within EHS might. Such apps/activities could launch others that might appear on the Recent Apps list and pose a security risk. The Recent Apps list can be cleared on pre-Android L devices by rebooting the device. Android L devices retain the Recent Apps list after a reboot. Use App Manager through EMDK, StageNow or a third-party MDM system to clear the list. To manually clear Recent Apps, bring up the Recent Apps list by long-pressing the Home or Menu button (depending on the device) until the list appears, then swipe away each app. If using EHS with Zebra's MX Multi-user feature, it's important to disable the EHS Bypass Keyguard feature. Failure to do so will prevent the MX multi-user login screen from being displayed. Refer to the Bypass Keyguard tag for settings instructions. MX Multi-user has the ability to override EHS-imposed restrictions on access to System Settings. Users logged in as an MX Admin will have full access to System Settings at all times. MX non-admin users by default will have access only to Sound, Display and About screens. 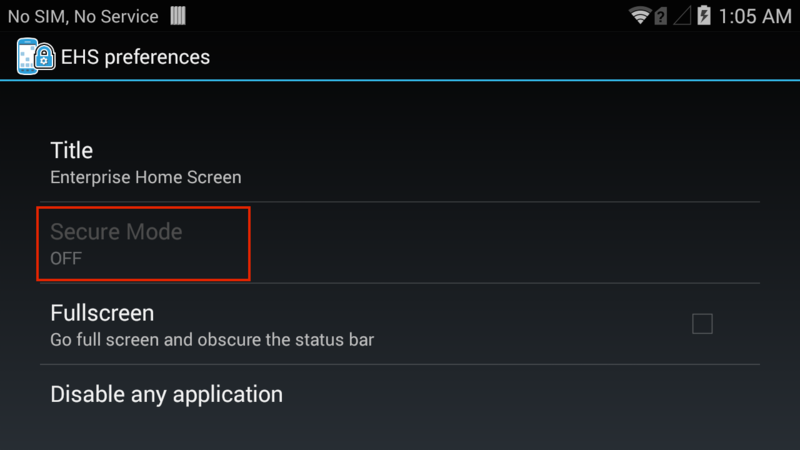 On devices running Android 4.4 KitKat, users might gain access to Airplane mode, Wi-Fi, Bluetooth and other device settings via the Quick Settings menu in the Notification drop-down. This can be prevented with the Disable Status Bar Settings tag. MX modules are accessible using EMDK or StageNow tools. Taking a screenshot (by pressing the "volume-down" and "Power" buttons simultaneously) while in User Mode might expose users to the Gallery app. To prevent this, disable the Gallery app in the Disable/Enable Applications section of Optional Feature Tags section. If the Programmable Keys feature on the Android System Settings panel is used to program a key to launch an application, that key mapping will be available in User Mode. 1. Download OpenSSL 1.0.1g or above for Windows. 2. Install OpenSSL on a computer with connectivity to the target device. 3. Dismiss the Visual C++ 2008 warning, if any, during installation and complete the installation. OpenSSL can now be used to sign EHS files.